I wasn't real satisfied with this dish. I think white wine and sage go better with veal as saltimbocca than they do on these ribs. 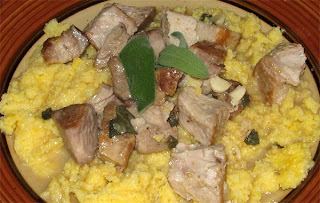 Country ribs braised in white wine, garlic, and sage, chunked and served over polenta.